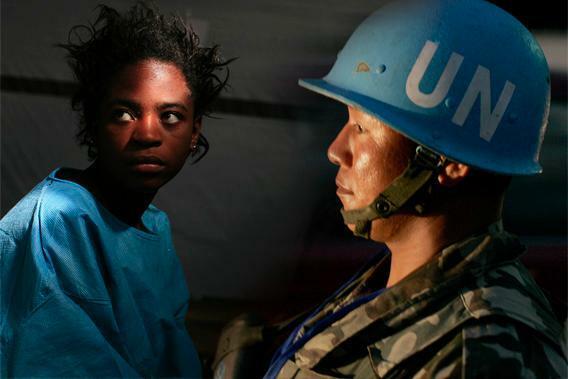 United Nations caused cholera outbreak in Haiti: Its response violates international law. On the left, a Haitian woman infected with cholera sits inside a clinic set up by the International Red Cross in Port-au-Prince, Haiti, on Dec. 11, 2010. On the right, a U.N. peacekeeper from Nepal stands guard at a checkpoint on a street in Port-au-Prince on March 25, 2008. Click on the image to view a photo essay about the Haiti cholera epidemic. 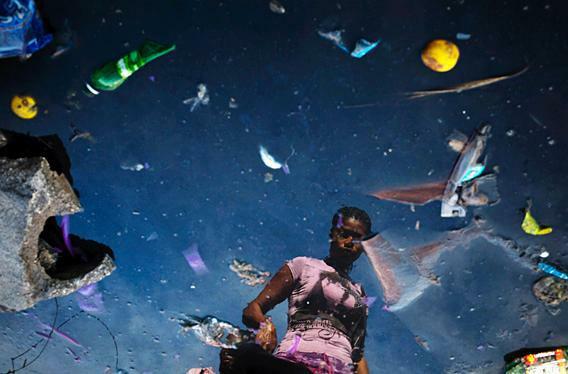 A woman crosses a polluted gutter in the main outdoor food market in the Petionville neighborhood of Port-au-Prince, Haiti, on Nov. 21, 2010. Click on the image to view a photo essay about the Haiti cholera epidemic. Why does this matter? The damage has been done; isn’t the U.N. correct to focus on its plan to eradicate cholera by 2022 instead of dwelling on what happened in 2010? Funding and implementing this plan will, critically, prevent future harm. But it will not address the harm that has already befallen so many victims—the men, women, and children who died or lost loved ones in a profoundly senseless tragedy. Every sidestep by the U.N. denies Haitians something truly fundamental: their right to be treated as humans who were wronged and are owed redress. The U.N. should accept responsibility, and it can, in a variety of ways. It can issue a formal apology for its role in the cholera outbreak, a solution that will cost nothing and will begin to mend the deeply damaged, mistrustful relationship between Haitians and U.N. forces. It can set up the “standing claims commission” that it promised in its peacekeeping agreement with Haiti and failed to create, and use this as a mechanism to hear the claims of victims and their families. While certainly complex and challenging, large-scale claims commissions created in the wake of tragedy are not unprecedented. The United Nations Compensation Commission in Iraq and the September 11th Victim Compensation Fund both successfully addressed claims of a diverse and large group of victims. Finally, the U.N. can offer a guarantee of nonrepetition, accepting responsibility for the wrong, acknowledging the gravity of harm, and ensuring internal change so that such preventable tragedy will not happen again. While conducting research in Haiti, we noticed a Creole slogan affixed to billboards and spray-painted onto cement walls: Kolera un se crim kont limanite! “Cholera is a crime against humanity!” It is the rallying cry of cholera victims’ advocates. It is now abundantly clear that the U.N. brought cholera to Haiti. By failing to accept responsibility for this wrong, the U.N. continues to disregard Haitians’ humanity.